Created by the Salvation Army in 1938, the first Friday of June has been set aside as National Donut day in honor those that served donuts to the troops during WWI and to raise funds to help those in need during the great depression. 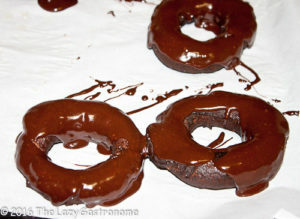 So in honor of those caring people and the humble round, fried cake, here is the quintessential of all donuts – Chocolate. They aren’t as hard as you might think! Mix the lukewarm milk with the yeast and let sit until the yeast starts to foam a little. Set aside. Beat together the eggs, ½ cup granulated sugar, brown sugar, melted butter, salt, and cocoa powder on medium until smooth. Add the milk and yeast. Slowly beat in 2 cups of flour. At this point, the dough will become sticky. Scrape it off the blades of the beater (do not taste or lick! The raw yeast can cause stomach pain and bloating and is not safe to eat!!) and start to mix by hand with a rubber or wooden spatula. 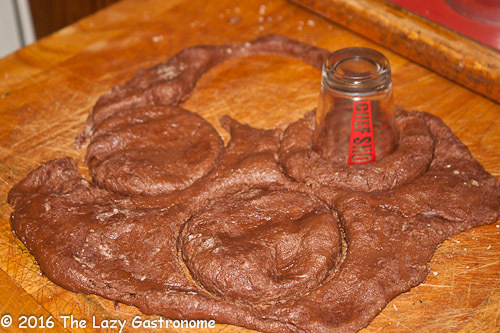 Continue adding the flour until you have a stiff, not sticky dough and can mix it with your hands without it sticking. 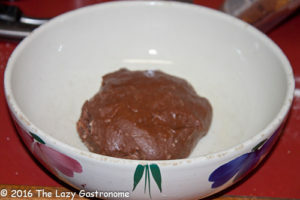 Lightly grease a bowl and place the dough inside, turning it once. 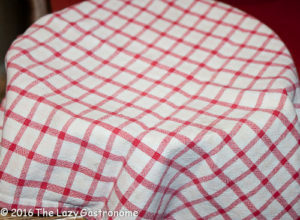 Cover and place in a warm spot to rise for about an hour. It should nearly double in size. Remove from the bowl and roll out about ½ inch thick. Using a donut cutter or two glasses, cut the donuts and set on a sheet. If using glasses, make sure the largest one is about 3” in diameter and the smaller one is a shot glass or smaller. The smaller will cut out the hole. Re-roll the unused dough and continue to cut until it’s gone. I rolled the remnants into a roll and formed a donut with them. And don’t forget to save those donut holes! Lay out some paper towels that have been sprinkled with some of the remaining ¼ cup of granulated sugar. Heat about 3 inches of oil in a pan to about 350 to 375 degrees. I uses a small pan (less oil) and did one at a time. Carefully drop the donuts into the hot oil. When they raise to the top, gently flip them to cook the other side. Carefully remove and place on the paper towel. 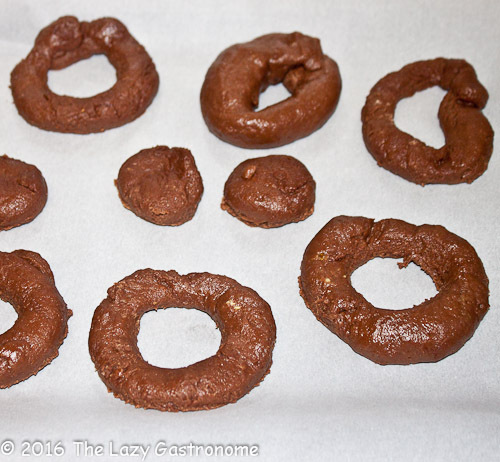 Continue cooking each donut, adding a bit more sugar as needed. As they cool, move them back to the sheet they sat onto rise. Heat the chocolate syrup in a small, non-stick sauce pan. Add the chocolate chips and stir until they are completely melted. 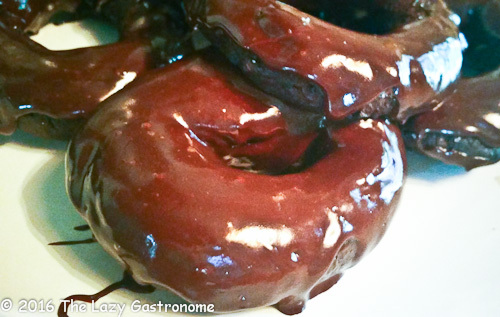 Spoon the hot glaze over each donut. Allow the glaze to cool so it firms up a bit, and serve warm or cold. My grandson at 6 in one sitting and gave them the “these are great” approval! 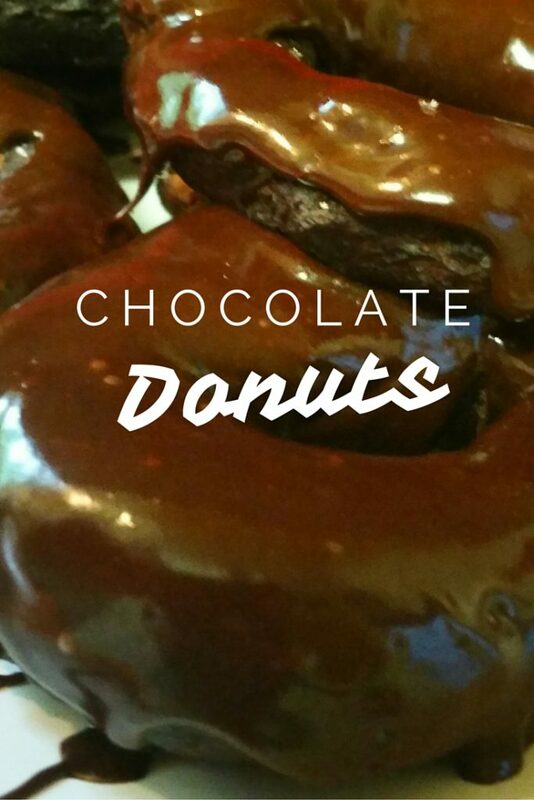 Makes about 1 to 1 ½ dozen.